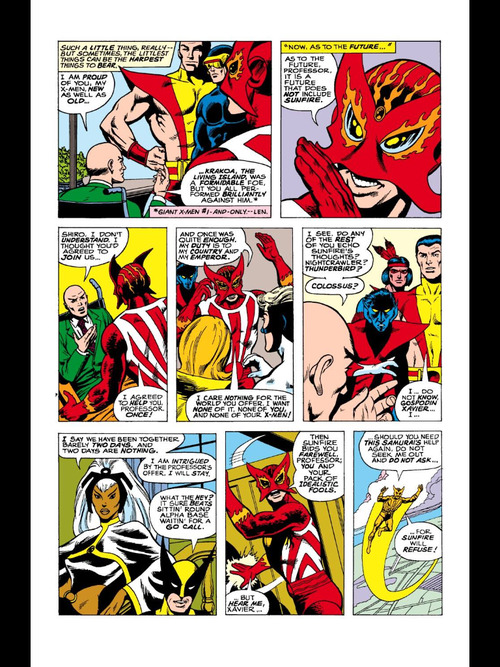 This issue begins with Professor X praising the X-Men old and new for their defeat of Krakoa but the jovial mood is broken when Sunfire quits the X-Men once again. 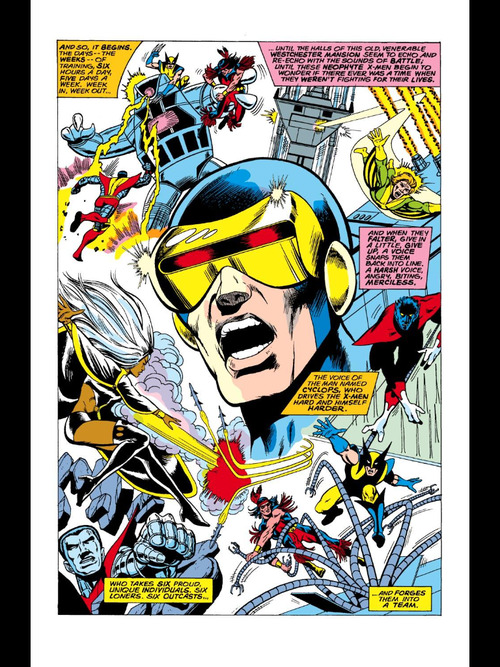 Then surprisingly, all of the original X-Men besides Cyclops also quit the team. The remaining X-Men then try out the danger room for the first time. While they are training, Count Nefaria and his Ani-Men take over a missile base in Colorado. 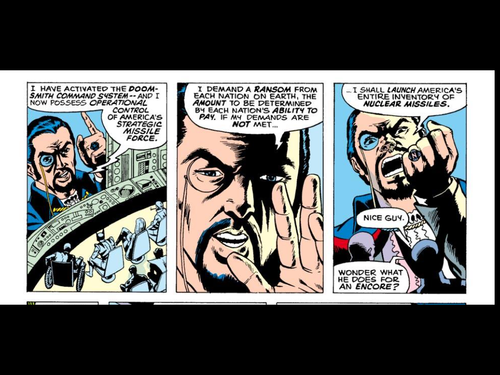 Nefaria then broadcasts a message across the world that he is demanding ransom from every country in the world or he will start a nuclear war. Beast contacts the X-Men as one of the Avengers and tells them that the Avengers are busy so the X-Men will need to save the day. When the X-Men reach the missile base, Nefaria blows up the Thunderbird but the X-Men are able to avoid death by ejecting in an escape pod. 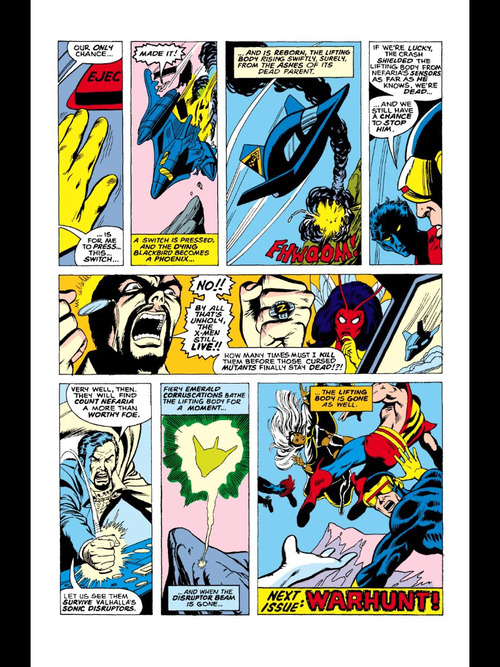 However Nefaria is then able to destroy the escape pod an the issue ends with the X-Men falling through the sky. After an amazing giant sized issue, issue 94 was a disappointment. 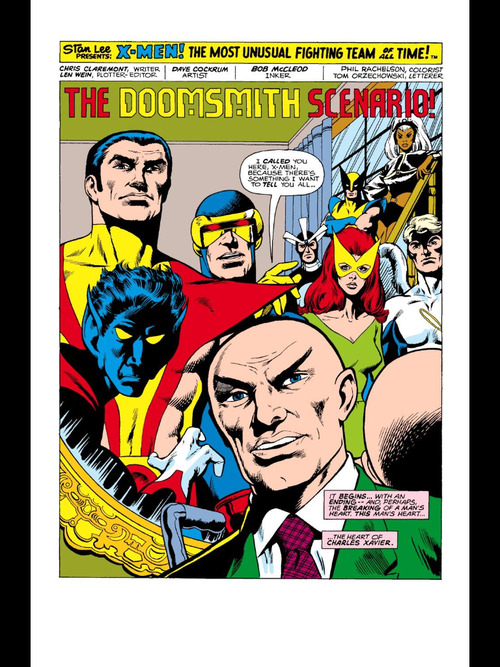 Nothing really happened in this issue besides the original X-Men and that was a bummer. Although I love the new members, it will be sad to not see as much as Jean, Bobby, Hank, or Warren anymore. 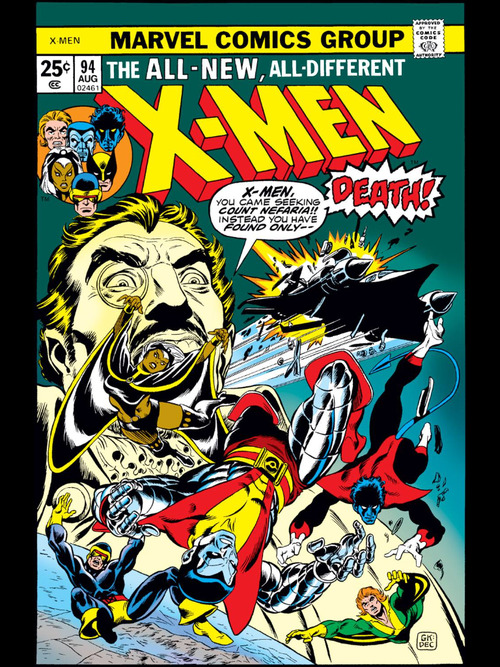 Count Nefaria and the Ani-Men are really lame as villains and they don’t even really get to face off against the X-Men in this issue. They kind of just sit tight and shoot a couple missiles at them. I was not expecting this issue to be so bad because Chris Claremont is my favorite X-Men writer. I guess it took him a few issues to get into his stride. I already know that the next issue is gonna be better then this one so I’m not too worried. 2. I love that Sunfire quit the X-Men yet again. 3. 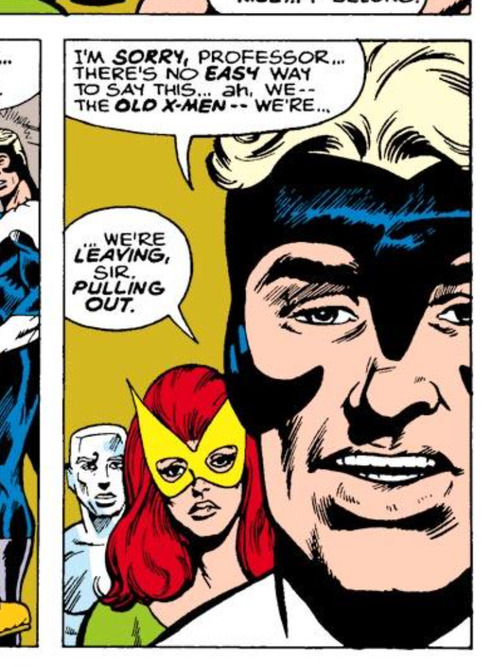 Jean and Cyclops get to have a nice moment. 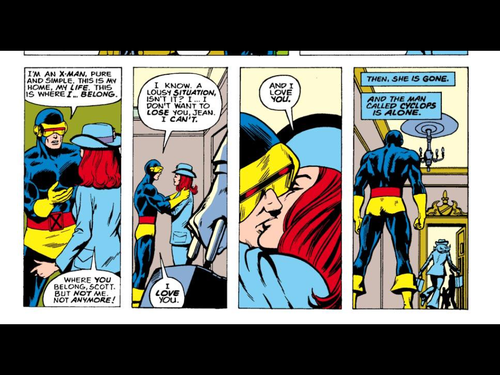 It took 94 (ish) issues for Jean and Cyclops to kiss, but the moment finally happened! “Killed by my eyes! My cursed, mutant, energy-blasting eyes!” Best scene in the entire issue. Interesting note: When the mini-capsule detaches from the Blackbird, it’s compared to a phoenix. I’m not sure if that was intentional foreshadowing, or just Claremont being incredibly melodramatic in these earliest issues. Regardless, this issue is very melodramatic, and not particularly good. The first three issues of the run aren’t very strong, but then it picks up in a huge way. Knowing Claremont, it really could be really far ahead foreshadowing. But yeah this issue was terrible. At least I know Claremont will improve quickly. It actually wouldn’t be that far ahead – Phoenix first appeared in #101, as I recall. Maybe 102. I’d have to check, and I’m lazy. O wow that is close! Claremont is definitely a planner so it wouldn’t be too surprising if he used the word Phoenix on purpose in this issue. In fairness, this was originally going to be Giant-Size Xmen 2, so breaking it up may have thrown the story structure off. Ooo that actually makes sense. I am familiar with the rest of this arc and it does seem better when it is all together. Honestly, I’ve never cared for Cockrum’s work, even though he’s revered throughout x-fan circles. This issue really is lacking. not much when it comes to development. I think you have to keep in mind the year – 1975 I believe. This seems to be typical art and writing for that era. Give Claremont some time. he gets into his stride in a couple issues. Yeah Cockrum isn’t my favorite either. I can’t wait to reach Claremont’s good work soon. What a dangerous world the Marvel Universe is! The Avengers are busy, so their threat must be MORE dire than the world being destroyed by nuclear weapons! Also, we gotta wonder about some of these names! Nefaria obviously suggests “nefarious”. Was that actually his name, or did he change it to that? And does he really think that he’s nefarious? I think most people think they are good, however wrong they may be. Now, in the case of Victor von Doom, I accept that that’s his name, and he’s too proud to change it. In any case, it strikes fear into people, which I’m sure he likes, and he likes to think of himself as doom for his enemies. Also, in what system of nobility is Nefaria a Count? It’s like Lord Voldemort; ordinarily, the Queen of England would have to dub you some kind of lord, but I’m pretty sure Queen Elizabeth never saw Voldemort, except in the movies and such. In Voldy’s case, it’s pretty sure he just gave himself the title. It turns out that Nefaria is of the Italian nobility. It seems he figured he was the natural master of the world. Well, the last Italian who had that idea was Mussolini, and we know how that worked out for HIM! I don’t believe the throne of Italy still exists, but there are plenty of hereditary nobles; one of them, Count Ciano, married Mussolini’s daughter. Awesome blog! This issue does have one of the most famous X-Men covers. It’s always a little extra disappointing when you re-read this old issues, issues like this one that have famous covers and now have this long history and you find out, they’re not that great. For me, it’s like watching old movies, you have to get new eyes to see how and why old comics are so good and realize that some old comics are really that bad lol.